The Eyes on Sheppard Vision and Learning Centre provides vision therapy and rehabilitative services to patients with a wide variety of functional vision disorders including, eye teaming, eye focusing and eye tracking problems, strabismus (eye turn), amblyopia (lazy eye), and visual processing deficiencies. Vision therapy and rehabilitation services can also benefit individuals with learning disabilities, traumatic brain injuries, including concussions, children with special needs and sports vision enhancement. Having ‘20/20 vision’ is not always enough. 20/20 vision only refers to an individual’s “eyesight”. It does not preclude difficulties using our eyes efficiently as a team, impacting learning, sports, and comfort in day-to-day tasks.Vision Therapy is a treatment approach that involves individualized weekly in-office sessions planned to meet a patient’s specific visual needs, whether it is problems with eye teaming, eye focusing, eye tracking, and /or visual processing skills.Vision Therapy is performed by a trained Vision Therapist under the supervision of a Developmental Optometrist. Weekly therapy is supported by home exercises that reinforce the visual skills addressed during the in office visit. The success of Vision Therapy has been well documented in scientific literature. Click here to see more Research and Resources on the benefits and efficacy of Vision Therapy. Most school vision screenings are only designed to detect vision problems that cause poor visual acuity. Very few school screenings test for eye focusing, eye teaming, eye movement disorders, and visual perceptual deficits. Further, many children do not voice their symptoms to parents or teachers because they don’t realize other people see differently. Individuals who experience the below symptoms should have an in-office comprehensive eye exam that investigates these systems further. Having 20/20 vision may not be enough to properly see the board properly. In order to see clearly, we change the focus of our eyes every time we look at different distances. For most people, the focusing system operates so efficiently that objects instantly appear clear and in focus. This adjustment in focusing is made through the Ciliary Muscle (the “focusing” muscle). One is unable to sustain this contraction or relaxation of the focusing muscle for an adequate periods of time. Approximately 5-10% of children and young adults have eye focusing problems which are significant enough to cause visual complaints. What are the symptoms associated with eye focusing problems? How are eye focusing problems treated? Eyeglasses can at times be prescribed to offer relief from the visual symptoms associated with focusing problems. Although glasses may provide some relief, the underlying problem remains and symptoms may persist. Therefore, eyeglasses alone are sometimes insufficient to completely resolve focusing problems. Vision Therapy is a treatment approach that involves weekly sessions of in-therapy, individualized to meet a patient’s visual needs. During these visits the patient is given carefully selected and sequenced techniques and activities to help the patient’s visual skills improve. This treatment restores flexibility and function to the eye teaming system with the goal of eliminating visual symptoms. What is an eye teaming problem? It is not enough to have ‘20/20 vision’ – our eyes must also work together as a TEAM. In order to see properly we have to use both eyes together in a precise and coordinated fashion. If our eyes are not in sync with each other, our brain will receive two different pictures, leading to eye strain, double vision, or “shutting off” one of our eyes. These symptoms make it very difficult to function either at school, play, or work and can result in a dislike or avoidance of near work such as reading. Approximately 5%-10% of children and young adults have eye teaming problems which are significant enough to cause visual symptoms. Good decoding skills, but poor reading comprehension Some children may appear to be asymptomatic since they simply avoid reading! How are eye teaming problems treated? Eyeglasses can at times be prescribed to provide relief from the symptoms associated with eye teaming problems. The glasses may contain a prescription or prism. The goal is to alleviate the visual stress placed on the eyes while reading. Often eyeglasses alone cannot completely resolve eye teaming problems. They act as a “crutch” rather than “active” treatment to improve eye coordination skills. Vision Therapy is a treatment approach that involves weekly sessions of in-office therapy, individualized to meet a patient’s visual needs. During these visits the patient is given carefully selected and sequenced techniques and activities to help the patient’s visual skills improve. This treatment restores flexibility and function to the eye focusing system with the goal of eliminating visual symptoms. In order to see properly, the eyes must have the ability to move accurately, smoothly and quickly from one object to another. These skills are essential during reading; to see the word clearly, move from word to word, and is integral for processing and understanding the information that is read. Inaccurate and slow eye movements can interfere with reading, comprehension and overall school performance. A child may have good decoding skills and normal sight vocabulary but may still experience reading and comprehension problems. In such cases, eye tracking is one area that should be investigated. How are eye tracking problems treated? Eye movement problems are unrelated to the optics of the eyes, so the use of eyeglasses is not usually recommended. In certain cases, eyeglasses may be able to magnify text for reading, which may help with tracking, but it does not fully remediate the underlying visual problem. A treatment approach called Vision Therapy can be used to treat eye movement disorders. Vision Therapy is a treatment approach that involves weekly sessions of in-therapy, individualized to meet a patient’s visual needs. During these visits the patient is given carefully selected and sequenced techniques and activities to help the patient’s visual skills improve. This treatment restores flexibility and function to the eye tracking system with the goal of eliminating visual symptoms. These skills are important when a child is young and is learning letter and number recognition, reading, writing, and early math skills. Visual Processing skills develop in most children without the need for any special attention or intervention. However, in some children the development of Visual Processing skills does not keep pace with the child’s growth in other areas. This lag can lead to learning difficulties. Visual skills also develop together with motor, speech and language skills. A child with a history of developmental lags experiencing difficulty learning in the classroom may benefit from a Visual Processing Evaluation. What should I do if I suspect that my child has a Visual Processing problem? If a child is experiencing any of the problems listed, a Visual Processing Evaluation is recommended. This is a specialized examination that usually lasts about one and a half to two hours. Testing probes the areas listed above and may lead to a better understanding of which areas may be contributing to learning difficulties. It is important to emphasize that it is not enough to have a Routine Eye Examination. The doctor must administer tests that specifically probe for Visual Processing problems. This should be discussed with your eye doctor before an appointment is made. It is also important to note that vision is a complex process. Oftentimes, children may experience eye teaming, eye focusing and eye tracking difficulties in conjunction with a visual processing problem. If these other visual skills have not been explored, your doctor may recommend a Binocular Vision Assessment before the Visual Processing Evaluation. How are Visual Processing problems treated? Perceptual Vision Therapy is a treatment approach that involves weekly office visits individualized to meet a patient’s visual needs. During these visits the patient is given carefully selected and sequenced techniques and activities. The techniques are modified throughout the program and as the patient’s visual skills improve, the therapy becomes more challenging. This treatment is specifically designed to help a child reach his or her normal level of development in the visual processing skills that are found to be deficient. The success of Vision Therapy has been well documented in scientific literature. Will Vision Therapy alone eliminate a child’s learning problems? Visual Processing deficiencies can contribute to a learning difficulty. Improvement in these visual skills can result in improved learning efficiency and concentration and better enable a child to benefit from standard or remedial education. 80% of classroom learning involves vision, however, there are children who may have learning difficulties due to other non-visual problems. There are cases where a child may require additional educational support to overcome reading, math or academic problems; Vision Therapy alone may not fully address their needs. The combination of Vision Therapy and educational remediation will often lead to the best overall result. Strabismus, known more commonly as an eye turn or crossed eye, and amblyopia, known as a weak or ‘lazy’ eye can significantly affect children and adults’ visual function. This can negatively impact one’s learning, work, play, and athletics. How can Amblyopia and Strabismus be treated? Conventional methods of treating Strabismus and Amblyopia often included surgery, glasses, eye-drops, or patching an eye. These options often help to improve the clarity of vision in the weaker eye, or improve the aesthetics of the eye turn, but may not improve one’s visual function and visual skills required for day-to-day tasks. Vision Therapy is a treatment approach that can be used instead of, or in addition to these conventional means to help work on visual acuity, eye alignment, as well as functional visual skills. It involves weekly sessions of in-therapy, individualized to meet a patient’s visual needs. During these visits the patient is given carefully selected and sequenced techniques and activities to help the patient’s visual skills improve including eye teaming, eye focusing, eye movements and depth perception. One in four children suffer from a learning related vision disorder. This is because 80% of learning occurs through the visual system. When both the eyes and Visual Processing system are not working efficiently, learning can be affected. Deficits in eye tracking, eye focusing, eye teaming, Visual Perceptual Processing can interfere with learning. 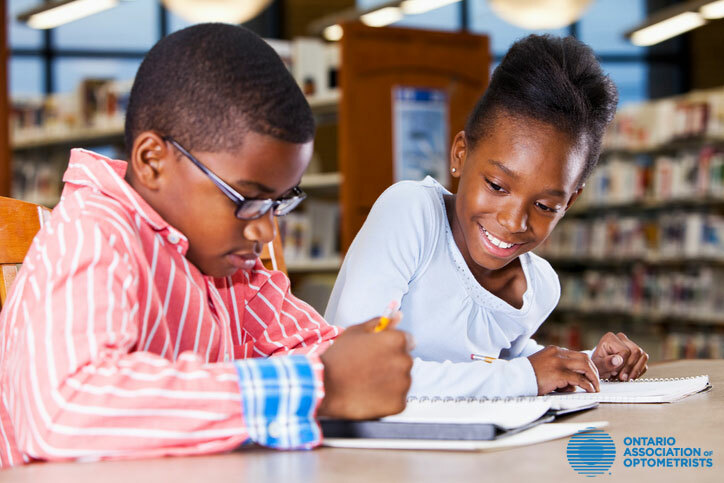 Vision Therapy works specifically on these systems, helping to remediate vision problems interfering with learning. While vision may not be the only factor contributing to a child’s learning process, it can be a significant one, and one that can often be remediated with Vision Therapy. 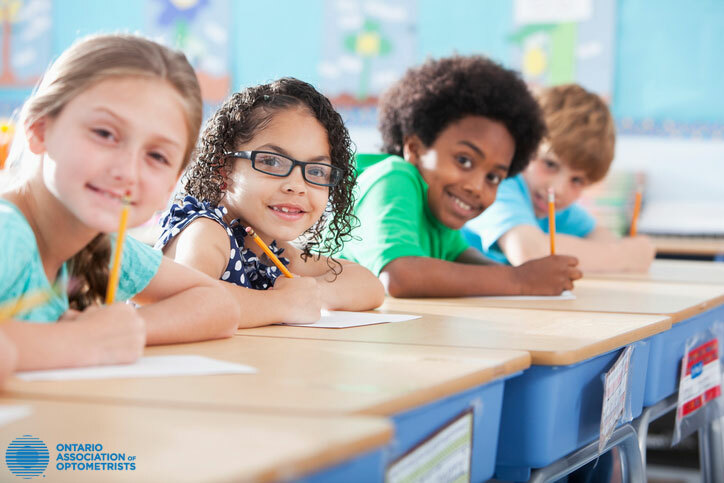 The majority of school vision screening programs test that children’s vision is 20/20 but does not test for learning-related vision disorders. In fact many children with 20/20 vision have a learning related vision disorder. Therefore it is essential that you take your child to an Optometrist to further assess these visual skills. If your child is suffering from one or more of these symptoms consider booking them for a Binocular Vision Assessment at the Eyes on Sheppard Vision and Learning Centre. Binocular Vision Assessment: A comprehensive evaluation into an individual’s ability to track, maintain and accurately change focus and maintain the efficient use of two eyes functioning together. Further testing into Strabismus and Amblyopia is also included in this evaluation. Visual Perceptual Assessment (Visual Information Processing Evaluation): A comprehensive examination of an individual’s ability to process visual information and integrate this visual information into motor and auditory modalities, visual recognition, copying skills, visual memory and directional organizational concepts related to academic performance. Pre and Post-Surgical Strabismus Consultation: An evaluation into the need for surgical intervention for Strabismus and the need for Vision Therapy before or after Strabismus surgery. Traumatic Brain Injury (TBI): Evaluation A comprehensive evaluation of visual deficits related to a TBI including both a Binocular Vision Assessment and Visual Perceptual Assessment. The evaluation may need to be split into multiple visits depending on the severity of the TBI and visual symptoms. In addition, the evaluation may also include further assessment into tinted lenses and prism lenses as additional treatment options. The majority of sensory processing pathways in the brain involve vision, and because of this, neurological disorders and Traumatic brain injuries (TBI), including concussions, can directly affect our visual processing, eye tracking, eye focusing, and eye teaming. Vision rehabilitation, in combination with tinted lenses, prismatic lenses, and patching techniques can help rehabilitate those patients suffering from symptoms. The approach to rehabilitation involves therapy focusing on the eye tracking, eye teaming, and eye focusing system in the initial stages, followed by Visual Information Processing as well as integration with other brain functions such as the balance/vestibular system and auditory systems in latter stages. Results form visual rehabilitation are most successful when it involves ‘team-based’ treatment, and is co-managed with other practitioners performing therapies such as occupational and physical therapy. What visual symptoms can individuals with ABI experience? If you are interested in assessing and treating a vision related symptoms relating to an acquired brain injury or neurological disorder, contact our office to book your Traumatic Brain Injury (TBI) Assessment with Eyes on Sheppard Vision and Learning Centre. Many sports require superior visual skills for maximal performance. Sports Vision Training involves weekly sessions of sport-specific in-office therapy, customized to meet the requirements of the athlete’s visual needs. During these visits the patient is given carefully selected and sequenced techniques and activities to help the patient’s visual skills improve. Athletes who are training and practicing hard without seeing results may have a visual problem limiting their success. There are many athletes functioning with poor visual skills who see their game improve once completing Sports Vision Training. Sports Vision Training can also help athletes who struggle to visualize theirs or there teammates plays and help with decision making skills by working on visualization (visual imagery). If you are interested in maximizing your visual skills to improve your sports performance, contact our office to book your Visual Assessment with Eyes on Sheppard Vision and Learning Centre. If you have a student or patient who you think would benefit from a Binocular Vision Assessment, Visual Perceptual Assessment (Visual Information Processing Evaluation), Pre or Post Strabismus Surgery Consultation, or Traumatic Brain Injury Consultation please click here for our referral form.